Many centuries ago, when Moscow was a few huts near a river, Christianity was unheard of and paganism held sway, Slavs celebrated surviving winter with a feast called Maslenitsa, or Pancake week. They lit bonfires, drank copiously, and ate tons of round, golden, warm blini - pancakes that symbolised the reemerging sun of springtime. When Christianity came along, the Slavs liked their blini too much to give Maslenitsa up, so like many pagan celebrations, the holiday took on another function, becoming the last chance to eat meat, fish, dairy and eggs and do some merrymaking before Lent. 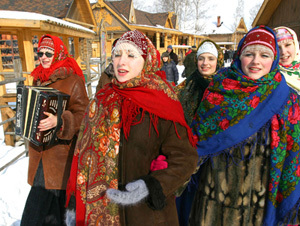 The communists tried to ban Maslenitsa, but it bounced back after the fall of the Soviet Union. Today, Maslenitsa is one of the few pagan festivals that have survived into modern times, a time for family celebrations, asking forgiveness, and trying to eat as much blini as humanly possible. Recipes vary, but here's one from my neighbour Anfisa, whose blini always come out firm, golden brown and delicious. 1. In a large bowl, combine flour with other dry ingredients. Add milk, sour cream and egg yolks, and mix until smooth and well blended. 2. Cover the bowl with plastic film and wait till the surface of the mixture is covered with tiny bubbles. This should take around a half hour. 3. Whisk egg whites until they are of a similar consistency as the batter, then add to bowl. 1. Preheat a griddle or frying pan over medium heat, and lightly brush with butter. Pour about 3 tablespoons of batter into the pan, making sure it spreads evenly. 2. Let the batter fry until the edges are golden brown and crispy and the centre appears dry. Flip over. Cook for about a minute, until golden-brown, and then remove onto a plate. Stack one blini on top of the other, brushing each one lightly with butter. Don't panic if your first few blini look odd; each cook has to get an individual feel for the process. You'll be producing one perfect specimen after another in no time. Blini go well with any number of toppings. Spread on your topping of choice, fold in half, then fold again, so you have a triangle. The simplest topping is butter. Sour cream is good, particularly with smoked salmon. Blini with butter and red caviar is a Russian classic, and fish lovers enjoy them with pickled herring and red onions. Then there's jam. Enjoy your blini, and happy Maslenitsa!